This year, for Christmas, I decided to go with a woodland theme. I want to decorate in a way so that I can leave things out even after Christmas is over. Christmas is my favorite holiday, but too often it comes and goes in the blink of an eye. I want to get as much out of this season as possible, so I chose a theme that can last throughout the Winter! If you are like me, the family room is where we spend most of our time together during the holidays. Whether it's cozied up by our fireplace watching a movie, hosting a dinner party, or just hanging with friends, this is the room that you really want to focus on. I had a chance to stop over at Arhaus to look at some of their stuff! The furniture and decor is absolutely beautiful. I could definitely see some of their pieces in my home. I created a list of my favorite things from their store. I really had a hard time narrowing down my list. There were so many beautiful pieces in that store. When it's time for a new sofa, I know exactly where I am going. Follow the link below to check out all of their beautiful sectional sofas. Our family room also includes our 11' Christmas tree that fits perfectly in the corner next to our fireplace. We hung a few stockings on the mantel, set up the manger scene next to our tree, and added a few candles to set the mood. Now I never want to leave this room! 1. When decorating for the holidays, try to choose items that will last throughout the Winter months. 2. Think of your sofa or sectional as the starting point for your room and build around it. 3. Use fresh greens for table top centerpieces, garlands, wreaths, and in vases. for the tree, or maybe a Christmas painting with red & green accents). 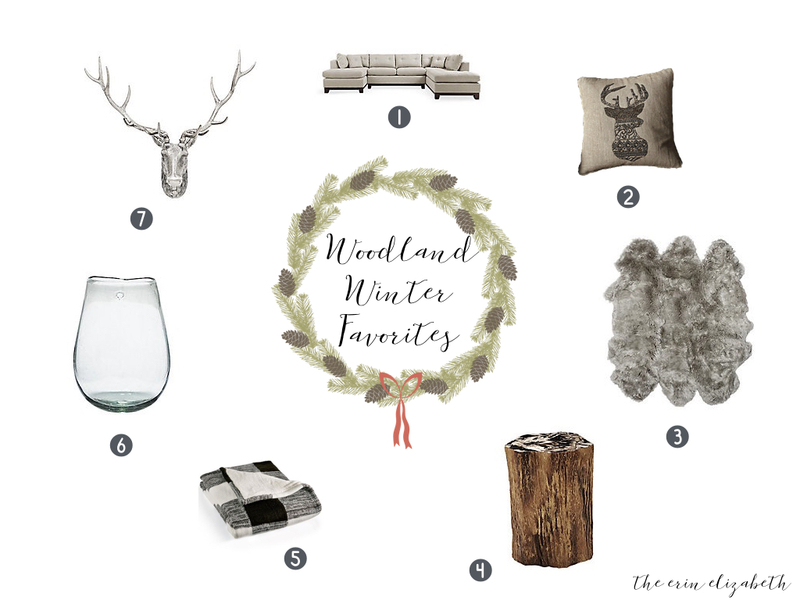 I tend to go for more neutral colors when styling and decorating my home, so the woodland theme is perfect for me. I am so excited for this upcoming holiday season! I hope that this post was helpful in giving you some ideas for decorating your home! Be sure to follow me on Instagram --> the.erin.elizabeth. Starting this Saturday, I will be posting some more decorating ideas for the holidays! Have a Happy Thanksgiving! !